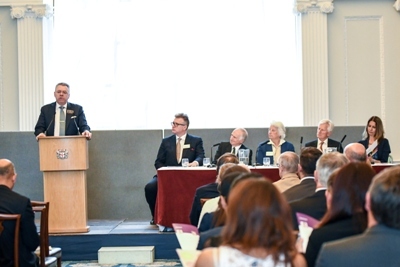 David Stringer-Lamarre, MD of FortisCL, within his role as Chairman of the Institute of Directors, London Region, was very pleased to deliver the closing remarks at this fiully booked Institute of Directors (IoD) City of London Branch event at the Mansion House in the City of London. The Rt Hon The Lord Mayor Charles Bowman delivered the opening presentation noting the importance of trust to society and business. Alderman Alastair King, Chairman of IoD City of London proved a framework speech and then invited the distinguised panel to speak. Sir William Blair was the Judge in Charge of the Commercial Court of the High Court 2016-2017. A member of Lincoln’s Inn and previously a QC, Sir William is a Visiting Professor of Law at LSE and Professor of Law and Ethics at Queen Mary, University of London. He is also a Part Time Judge of the High Court of Hong Kong. He was also formerly the Chairman of The Financial Services and Markets Tribunal. His other appointments include being Chairman of the Qatar Financial Centre Appeals Body in 2006. Philippa Foster Back CBE, since 2001, the Director of the Institute of Ethics whose main purpose is raising awareness and sharing best practice in business ethics. She is a Board member of the Chartered Institute for Securities & Investments, RAND Europe and Barrier Biotech Limited. In 2008 she was a member of the Woolf Committee looking at business practices in BAE Systems. Philippa sits on the Stakeholder Panel of the Financial reporting Council. was Gentleman Usher of the Black Rod (“Black Rod”). Kristiane Backer is a prominent German television presenter and author. She was the face of MTV Europe in the 90s and hosted a daily culture programme on NBC Europe. She is now a businesswoman and regular television commentator. A convert to Islam in 1995, she has published her autobiography “From MTV to Mecca – how Islam changed my life”.